Powers/Abilities: Able to fly. Light-based powers. History: When the city of Isiksehri's official mascot, Bayan Mucize (Miss Wonder), accidentally died, the special formula that granted her powers was passed on to a young woman who became Pirilkiz (Glittergirl). Though she was intended only to be a light-hearted way to keep up the spirits of the city's residents, Pirilkiz soon found her role becoming much more serious as she defended the city from various threats. Comments: Created by Hakan Tacal and Mahmud A. Asrar. Glittergirl first appeared in the Turkish anthology magazine Strip (a.k.a. Rodeo Strip) in 2004. 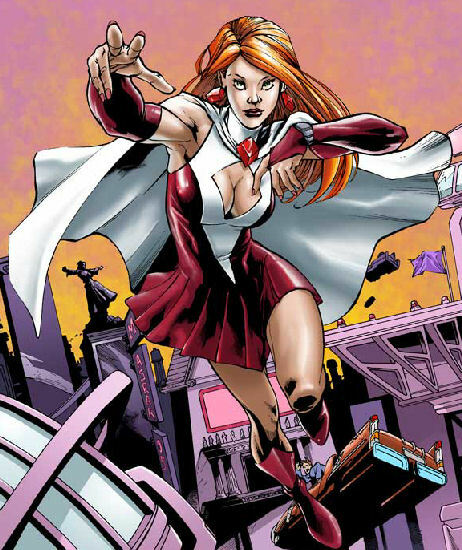 She continued to appear in the magazine up until #14, the final issue, in 2006. She also appeared in the Turkish comics fanzine Capa, and the series Gorajun..
Glittergirl will be appearing in the War of the Independents.